God doesn't always get what He wants. Does that shock you? However, He chose to create man with free will choice, so that those who came to Him would choose Him and have an intimate love relationship with Him. He didn't want us to be robots who had no choice. That relationship would be worthless. When teaching us how to pray, the very first thing He taught us to pray was that, "Thy kingdom come, Thy will be done, on earth as it is in heaven". In His kingdom, made up of those who have given Him their lives and now live to serve Him, there, His will is done. In the world, mankind does as he pleases, not as God wills. It is true that nothing happens here without God's "allowing" it. He is indeed the ultimate power. But it is also true that He does not always get His will in this world. Just because He allows something to happen does not mean He willed it so. When He made us free will creatures, He committed Himself to abide by the choices we would make. The choices we make have consequences, good and bad. At times, some one else's choices have consequences that adversely affect our lives, such as someone driving after drinking alcohol and injuring or killing someone we love. If we are in Him and walking faithfully, praying without ceasing as He taught us, sometimes we see His divine intervention in the events of man and we should rejoice and praise Him greatly for it! 1 Thessalonians 5:17 I believe this has saved us and our loved ones from many bad things. There are times when our choices have brought us to a desperate place of consequence. I know people who have given Him their lives and He has divinely lifted those earthly consequences from them instantly, as well as saving their souls. Most often, we must walk through the consequences ourselves. This path affords us so many opportunities to grow in the fruits of the spirit and in our walk with Him. If anyone dies and spends eternity in hell, it will be their choice, not God's will for them. Hell was created for the devil and his angels, not man. God the Father has done everything to woo us to Himself and eternity in heaven. If we refuse Him and His only begotten Son, Jesus Christ, then we have chosen hell and will get our choice. God made us to have free will choice and He will respect the choice we make - and it will not be changeable for all eternity. God does not always get what He wants - He wills that all men would be saved. Just as He said there will be more rejoicing in heaven over one sinner who repents than over many righteous men who don't need to repent, this shows there is great pain and sadness for God when one is lost. He has done everything to save us, it is our choice, and it is eternal. Won't you make the decision for salvation in Jesus Christ right now? We are not guaranteed another minute and eternity looms before all of us. Choose a good consequence and God bless you!! See you when we all get home! If you need help on how to give your life to God, I am always available in e-mail at lynette@lynettesphotoart.com and there is information in your download that can also help you. I hope you love this cluster as much as I do! Everything I used in this cluster I have either already given you or will soon, except the leaves which are from lescrapdangel and thanks to her for her generosity! I used my Love Bears, Star Swirls, the heart from Feather Frames, Jewels and Embossed Hearts, so you'll know what to look for. Please read my TOU at the bottom of the post and respect them. All my work is protected under international copy right law. This is for your personal use only. Don't share, but send others here to get theirs, I'd love to meet them! This is soooo cute! Thank you! I selected you and your blog as a recipient of a BLOG AWARD! Your blog is beautiful, and creative. You are so sweet and kind to others in your sharing and generosity. Please pick up your award, share where you received it, and please pass the award on to 5 others. Thank you! Your blog post will be advertised on the DigiFree Digital Scrapbooking Freebie search engine today (look for timestamp: 16 Feb [LA 07:00pm, NY 10:00pm] - 17 Feb [UK 03:00am, OZ 02:00pm] ). this is very nice indeed , perfect for layouts of kids .. thank you so much ! This is a gorgeous cluster. Thanks so much for sharing. This is adorable. Thank You! Praise God for you for sharing His Path on the internet. Thank you so much for this Freebie. I want to let you know that I posted a link to your blog in Creative Busy Hands Scrapbook Freebies Search List, under the Elements Only, Papers Only post on Feb. 17, 2009. Thanks again. Oh ! 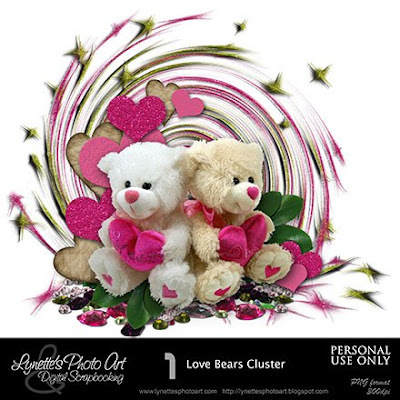 Yes, these teddies are adorable and beautifully extracted but the way you personalize your creations is ALWAYS outstanding !! Merci BEAUCOUP for this new gorgeous embellishment ! !